WITH THIS HASSLE FREE PLAN ! Once you decide to try the rental business, you can get started by letting us know. We will set up a private meeting with you to determine the amount that you wish to invest and any other details about your investment goals. Once we have determined your goals, we will help you to locate a house or houses to purchase. We will search both local MLS and any for sale by owners. If we purchase a house through the local MLS of course we will receive a partial commission which pays us for our efforts. However, if we locate a for sale by owner, we will also help you with that purchase for a set fee which will include an analysis of repairs and assisting with the contract and closing. This will normally be handled for a set fee in the range of $500 depending on the amount of work needed. We can assist you with financing, if that is needed. If you already have a relationship with your bank and want to stay with that source, then we will work with your banker. If you want to seek new financing, we can help you with that also. Once we have completed the purchase of the house, then we will co-ordinate any of the needed repairs, clean up or renovations. It is feasible to purchase a fixer up at a reduced price and then complete the renovations. If we oversee the renovations, we charge a 10% construction management fee. If the repairs are minor or just cleanup is needed, then no additional fees would be charged. Once the house is ready for occupancy, we advertise it in the local paper and with a yard sign. We also receive a number of cold calls each day for rental property. Normally, because our homes are clean and ready to be occupied, they are rented in less than a week. All of our rent is due on the 1st of the month, late after the 5th, except for allowances made for weekends and holidays. We try to collect as much rent as possible by the 10th and then disburse your money to you no later than the 15th of the month. Because of this cycle, it is beneficial, if you are borrowing money, to have your note payments due after the 15th of the month, if you are using the rent to make the payments. Any money collected after the 10th will normally be disbursed the following month. If you are unsure about how this will work for you, then we suggest that you start with one house to get your feet wet. Then you can add more and sometimes you can purchase several in a bundle. Then, in the event you decide to invest elsewhere, you can get out by selling the one house. 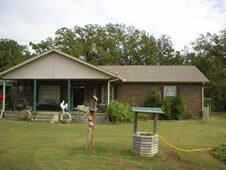 1217 North Hwy 81 in Duncan, OK.
* This applies to residential rental property only. Some principles could be applied to commercial. 1. You (the investor) only wishes a return on your money investment and have no desire to actively participate in the rental process. You will use a rental management company. 2. You also have no desire to participate in the renovation or repair process of owning rental property. 3. You have cash reserves and/or credit sufficient to purchase real estate. You may desire to purchase with cash or you may desire to leverage your available cash to purchase more property and to allow the tenant to make your mortgage payments. Either way there is normally a need for some available cash and/or a good credit rating. 4. You are willing to assume a minimal risk in return for receiving a 10% or more return on your cash investment, plus a desire to own property totally paid for by someone else, that you can sell in the future. 1. We locate a 3 bedroom frame home with 1 bath, floor furnace heat and no air-conditioning with a listed price of $30,000. 2. We investigate the local market and find that this home will have a minimum rent potential of $450 per month. Based upon that amount of rent and a GRM of 70, we establish a target price of around $31,500. This is done by multiplying the GRM of 70 by the Rent of $450. This target price can vary up or down, but the higher the price in relation to the rent received, the lower the percentage of return on the investment. GRM is explained on last page and it can also vary with each investor’s needs. 3. Upon an examination of the subject house, we determine that we will need to spend up to $3,000 in repairs and renovations to make it into rentable condition. This could include a wall heater to replace the floor furnace ($500), some interior paint on walls, ceilings and cabinets, electrical and plumbing work and other miscellaneous repairs. These costs need to be estimated prior to the purchase to make sure that you are not getting into a real money pit that will require excess funds to repair. Proper inspections by an expert can normally result in a fairly close estimate of costs. 4. We also estimate that it will cost approximately $1,000 in closing costs to purchase the house. This would include loan fees, title examination work and any closing fees. 5. Based on all of these facts, we are able to negotiate the purchase price down from the asking price of $30,000 to one of $27,000. DON’T BE AFRAID TO MAKE LOWER OFFERS! If anyone is offended this their problem because the final price must fit in your established guidelines. To this purchase price we add the cost of repairs ($3,000) and the closing costs ($1,000) to bring us to a total of $31,000 which is very close to our targeted price. So our total investment for this example is $31,000. Monthly net income = $291.42 (see above) less monthly debt service ($222.19) = $69.23 / mo. Return on cash investment = $69.23 x 12 months = $830.76 divided by $7,750 = 10.7% Cash on Cash return. *Of course these figures could be improved if you are able to negotiate a lower interest rate from your bank or a longer amortization. The figures shown here are only for example and not meant to guarantee interest rates for any bank or financial institution. OVERALL RISK: The risk factor on this type of investment is very low. I have been managing real estate rentals for almost 40 years and have never seen anyone lose money on rental property as long as they followed our guidelines by keeping their property in rentable condition and by not overspending when they bought. It is always possible for real estate to go up and down in value. However, we have experienced two downturns in the local economy in the past 40 years and the rental market was not as adversely affected as was the other parts of the market. If people loose their homes due to foreclosure, then they must rent so, while it is unfortunate, that just increases demand for rentals. We advise our owners to stay in the lower part of the rental market with their investments so they are less affected by a market downturn, than some of the higher priced homes may be. The most common objections, that we hear in owning rental property, is having to fix them up after a renter moves out. If you don’t like doing that kind of work, hire a rent manager who will take care of it for you. Sometimes the expense will be more than the amount of the renters deposit but we have allowed another 10% per year in our figures for upkeep and replacement of appliances in addition to the damage deposits. You will find that over a period of time with a number of units, this should be more than sufficient for repairs and renovations, assuming that you start with them in fairly good repair. You will have some homes that will require no work in a 12 month period and that will offset the one that moved out after six months leaving a mess and requiring both repairs and cleanup. We can handle all of the repairs needed either by hiring a sub-contractor such as a plumber or by working on it with our own crews, or we more than welcome any investor who likes to work on houses to do their own work, as long as they are repaired to our minimum standards. One of the things that we insist on before showing a house is that it be clean and bug free. We believe that this fact has helped us to maintain a very low vacancy rate which currently runs from 0 to 2% on any given day. Basically with our rent management policies, the owner worries about nothing except cashing his net proceeds around the 15th of every month. LOST RENT: We make every effort to collect all of the rent due because that is how we get paid, however on occasion we are unable to collect all of it for any of a number of reasons. Sometimes we will begin legal action or evictions when the tenant may only be 15 days late if we see that the situation will not improve. Other times we will give them additional time if they make an attempt to pay parts of the rent and have legitimate reasons for being late. We have built into our figures a 5% loss for vacancy and uncollected rent. Because we aggressively attempt to collect rent and don’t allow people to build up a huge debt and because we don’t have very many delinquencies, our losses are considerably less than that amount for any given year. WHAT IS THE GRM? That is a short explanation of the Gross Rent Multiplier. The GRM is a pure mathematical number which can be derived from the market as rental homes are sold or it can be formulated to meet the individual needs of any individual investor. The GRM is multiplied by the amount of gross monthly rent to give a target amount which may be invested in that house. In this market we find that a GRM of 70 produces a decent yield for an investor purchasing with cash and also allows for cash flow for the investor who is leveraging his money with bank financing. The old rule of thumb was that you could pay as much as 100 times the gross monthly rent (GRM = 100) but 50 times was a better bargain. A GRM of 70 falls between those amounts which provides a realistic return and property can still be purchased at those prices in our market. In other markets, as an appraiser, I have seen the GRM as high as 120 but that requires a much longer payout so the investor needs to be younger or be providing an income for their heirs. My target for financing is from 10 to 15 years. Ideally the debt service (monthly payment) on a loan would be in the vicinity of 50% of the gross monthly rent. If the investor has some cash reserves it can be higher than that, however if cash is tight, this ratio will assure sufficient cash flow each month to cover all expenses plus insurance premiums and ad valorem taxes, and provide an amount left over for the investor which gives him a return on his cash downpayment. While it is possible to pay more for the property than this amount, the investor must realize that it will tighten his cash flow (on borrowed money) and/or lengthen the time it takes to return his money.